Purpose: Use this document as a reference for using the Assign Proxies page to assign a single user to multiple procurement cards in ctcLink. Note: The Assign Proxies page allows you to manage Proxy Assignments from the viewpoint of the proxy, as opposed to the viewpoint of the card or cardholder/custodian when those assignments are made through a Cardholder Profile. NOTE: If the proxy does not have any Proxy Assignments to any cards, the Assign Proxies page is blank. You can search for the cards to add to a proxy by clicking on the SelectProcurementCards link text. NOTE: Selected cards will show up under the proxy’s Assign Proxies page. 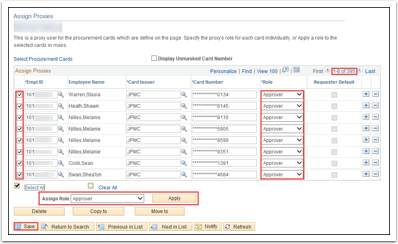 If a proxy has one applicable assignment Role, Approver via their CC_APPROVER role assignment, all of the added cards are given a Proxy Assignment of Approver. 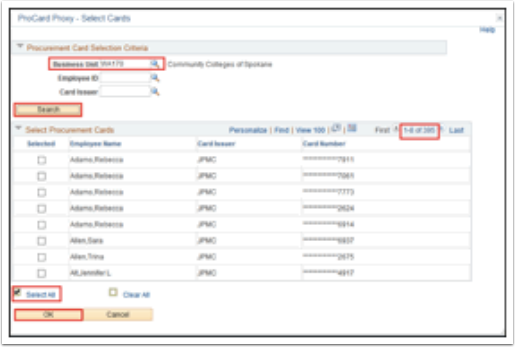 If needed, you can also adjust the assignment of one or multiple cards by using the selection check boxes, Assign Role dropdown list and Apply. NOTE: Once a proxy has assignments for those cards, they will NOT show up in another search to add new cards. 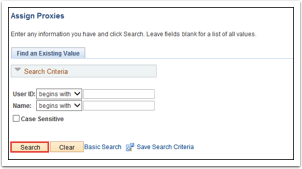 The Select Procurement Cards search will only return cards that are not already assigned to that person.